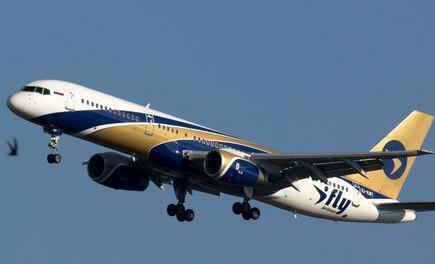 The Russian tourist charter airline IFly is planning to add new aircraft types to its fleet in 2016 in the light of the restrictions on flights to Egypt and Turkey introduced by the Russian authorities, the withering demand for the carrier’s other leisure destinations, and the standing plans of the travel agency Tez Tour, I-Fly’s largest customer, to develop domestic tourism in Russia. IFly started out six years ago with a fleet of five 221-seat, all-economy Boeing 757-200s. This year, the airline stopped operating three airliners, all built in 1999. The carrier continues with the two airframes manufactured in 1999 and 2001, registered EI-DUC (I-Fly’s first airplane to haveundergone a D-Check in Russia, at a Sibir Technics facility) and EI-EWT, respectively. “We aim to slightly decrease our capacity while staying in the curent price bracket, because our partners are very strict about seat prices on certain routes,” Butrin says. “Our strategy is also about embracing the most efficient operations possible. This is why our aim is to get mid-aged aircraft (aged 10 to 12 years) with clear-cut operating costs. We will choose between 189-seat Boeing 737-800s and 156-seat Airbus A319s.” According to Butrin, IFly might also go for Boeing 737 Classics, which Tez Tour asks for on a number of domestic city pairs in Russia. Tez Tour’s area of interest that generates nearly half of I-Fly’s passenger numbers has the Black Sea resorts of Russia’s Krasnodar Region at its heart. At least 20% of the travel operator’s clients who used to spend their vacations in Turkey say they will choose the Krasnodar resorts now. On the other hand, the Tez Tour press service says, the company will continue to actively promote Greece, Bulgaria, Spain, UAE, Cyprus,and other foreign destinations. IFly carried 567,268 passengers in January-October 2015 what was an almost 39% drop compared to the same period of 2014.